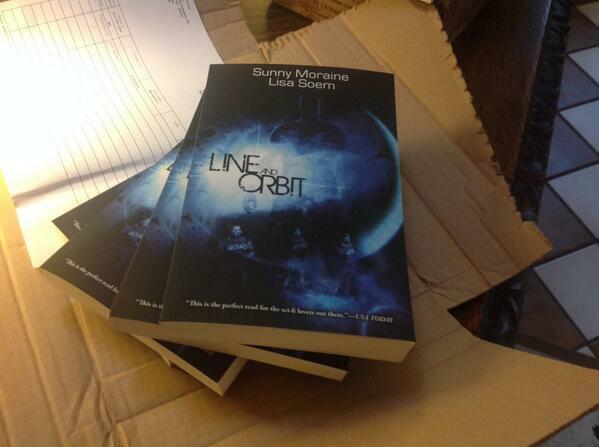 LINE AND ORBIT ~*~*paperback*~*~ giveaway! This time next month, the trade paperback edition of Line and Orbit will be available to purchase. Isn’t that exciting? But wait!! YOU DON’T NECESSARILY HAVE TO PAY FOR YOUR OWN COPY. Because I’m giving one away, you see (one of those pictured up there, oh they are so pretty). And even BETTER: it will be signed by me and my lovely co-author. Want to enter? Simply fill out this handy form. I promise to guard with my very life, and completely forget, via extensive sessions of hypnosis, all of your personal information as soon as the contest is over. At midnight on February 4th, the contest will end, and I will select one lucky person. This entry was posted in giveaway, Line and Orbit and tagged book giveaway, free book, gay romance, giveaway, lgbt sf, line and orbit, m/m romance, QUILTBAG sf, science fiction, science fiction romance, space opera. Bookmark the permalink.